I read this article and found it very interesting, thought it might be something for you. The article is called Dominique Chickens and is located at https://www.chickencoopguides.com/breeds/dominique-chickens/. If you’ve always wanted to raise backyard chickens for eggs, now is a great time to start. Chickens are becoming more popular as pets all the time and are no longer relegated to farms. Many suburbanites are setting up coops in their backyards to enjoy the convenience of fresh eggs and live a more green and sustainable lifestyle. Dominique chickens can be a great choice for a flock of egg-laying chickens. Dominique chickens are recognized as America’s first official breed. Their lovely black and white “cuckoo” coloring and distinctive high tail make them stand out from other breeds. Dominiques can sometimes be mistaken for Barred Rocks because of the similar coloring. However, the barred pattern is distinct from the cuckoo pattern. The comb is another factor in the Dominique chicken vs. Barred Rock determination. Dominiques have rose combs whereas Barred Rocks have single combs. Dominique hens are prized for their docile temperament, hardiness in extreme weather, superb egg-producing capability, and long lifespan. They also tend to lay year round, even in cold weather. This is a “broody” breed, meaning the hens are good mothers to their chicks. This is an advantage if you want to raise chicks without having to invest in an incubation system. Though primarily used as egg layers, Dominique chickens are good as meat birds as well. When you’re creating a home for your flock, it’s important to ensure the proper setup for your chickens to be happy, healthy, and safe from predators. You’ll need a coop that’s large enough for your flock to reside comfortably and nesting boxes to encourage egg-laying in easily accessible places. You’ll also need adequate heat during the colder months, and adequate food and fresh water dispensers. 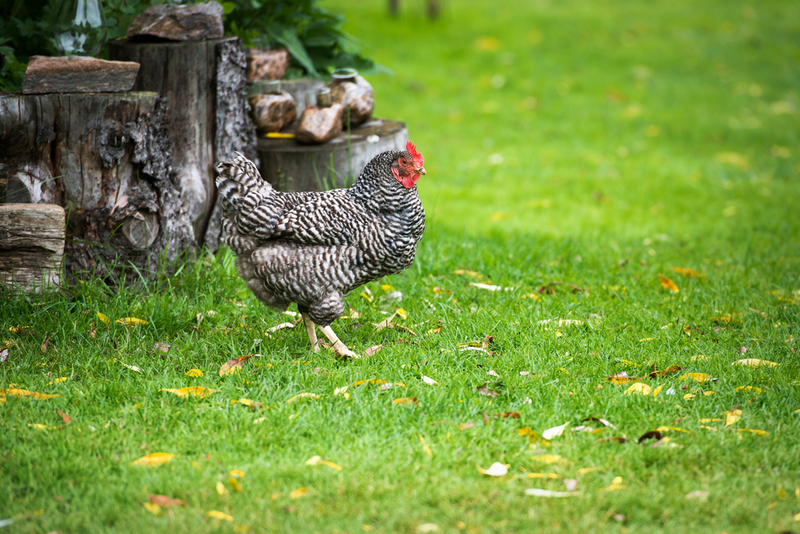 Most chickens enjoy roaming, both to get exercise and to forage for insects. You can give chickens free range of your yard or fence off a section for their use. It’s important to ensure fencing is strong enough to keep out predators. Most people who raise Dominique chickens do so for the eggs. These hens usually lay about four eggs per week even during colder weather. It’s important to collect eggs every day, especially in the winter so they don’t freeze. Most people agree that farm-fresh eggs don’t need refrigeration as long as the “bloom” on the shell remains intact. However, if you prefer to wash your eggs immediately, it’s a good idea to store them in the refrigerator. If you choose to keep a rooster for the opportunity to raise chicks, you can still harvest eggs. As long as you collect eggs every day and refrigerate them, fertilized eggs are essentially indistinguishable from unfertilized eggs. Dominique chickens can be ideal for a backyard chicken flock. They’re excellent producers even in cold weather, and their gentleness makes them ideal for families with young children. Dominiques are beautiful with their patterned black and white plumage, red comb, and unique high-tailed silhouette. Be sure you create a great home for your chickens by purchasing a well-designed chicken coop and adding a fenced area to allow for exercise and foraging. You can enjoy the satisfaction of keeping chickens as gentle pets that also provide food for your household.